Advantages: An excellent attempt to set the record straight. 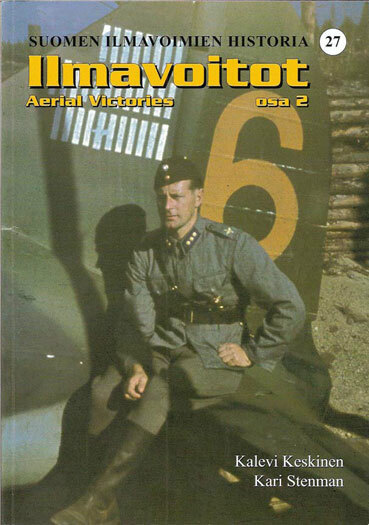 Following closely on the publication of the first part in this series, which I reviewed here previously, is the release of the second part of Aerial Victories. The format is basically identical to that of part 1, covering airman whose last name begin with “N” through the end of the alphabet. Also, there are three additional tables. The first lists aerial victories of foreigners. This includes the Swedish volunteers serving in Flygflottilj 19 and, interestingly, a few Danes serving in the FAF. The other two tables sets out aircraft destroyed on the ground and on water and balloon claims. Surprisingly, the number of aircraft destroyed on the ground and water appears to be relatively small. Perhaps there were few raids on VVS airfields or it was difficult to verify destroyed aircraft. This second part does include aerial victories obtained by gunners in multi-person aircraft. There are victories attributed to gunners in Lysander, Blenheim and Fokker X aircraft. There are also victories attributed to what appear to be mismatched fights. For example, Sgt. Rinkineva, on July 29, 1944, flying an I-153 “Chaika” shot down a P-39 Airacobra of the 773 IAP (Five I-153 “Chaikas” of TLelv 16, while on recon patrol, bounced about 20 VVS Airacobras, shooting down one before breaking off.*). Finally there are the excellent pictures. As was the case with the first part, and to the extent it was possible, there are individual pictures of the airmen and their aircraft. There are a number of interesting and informative group pictures included. These pictures are a good source of visual information on the various uniforms and flight suits worn by airmen of the Finish Air Force. There are also some pictures of the various styles of victory marking applied to the aircraft. As I noted in my review of part 1, this volume will have limited interest. Those who bought part 1 will, I am sure get part 2. For the rest of you who have any interest in aerial combat victories or the Finnish Air Force, you should consider obtaining both parts. A selection of pictures and color profiles in this book may be seen on the Kari Stenman Publishing web site.